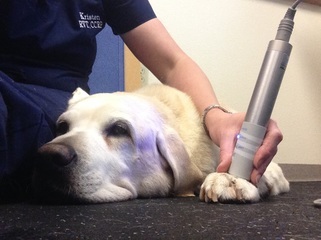 Therapeutic laser therapy, also known as low level laser therapy or cold laser therapy helps with chronic arthritis pain management (with the goal to reduce the use of oral pain medications), acute post-operative pain, wound healing and much more. Light energy travels to the target tissues, the cells, in the form of photons to give an extra energy boost, speeding up beneficial cellular processes and metabolism. With the extra energy, tissues are able to heal faster which reduces overall pain felt from a chronic condition.